The THR5A might be the coolest, most useful piece of kit for the electro-acoustic musician released in 2012. Mic range. Effects. Stereo sound. Versatility. A line out could take it from desk to stage. Few understand the electro-acoustic musician more than Yamaha. Its electros have long been the choice of players, and that may be why it sees a slot for the compact THR5A, the first THR amp for the electro-acoustic musician. 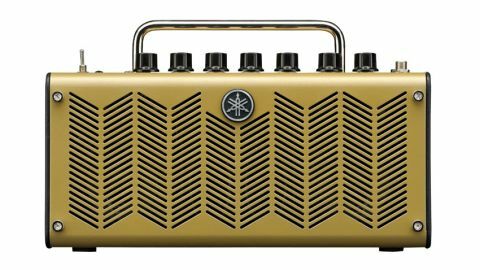 "The THR5A features four mic simulations (Condenser, Dynamic, Tube and Nylon) and one amp model"
It doesn't have programmable slots and only has a one-knob master tone control, but at £199 it's more affordable than the rest of the range (the THR10 has an RRP of £299) and offers the same USB deep-editing and recording, not to mention superb stereo sound. The THR5A features four mic simulations (Condenser, Dynamic, Tube and Nylon) and one amp model (EG Clean). For effects, we have compressor, chorus, delay, reverb, and via the THR Editor, you can get flanger, phaser, tremolo, spring reverb and noise gate. "With a laptop and USB mic you have an extremely portable recording setup"
It all adds up to a superb unit that, since we received it, has been constantly used for practice, writing, recording and general monitoring. With a laptop and USB mic you have an extremely portable recording setup, while the choice of mic models provides highly usable and accurate mic'd tones when DI'd. The effects sound rather classy, too. We hope Yamaha extends this concept to include performance features, such as a line output, and perhaps even a range of mini cabs.